Heath Ledger's family members bared their grief in an Australian newspaper, writing of the heart-wrenching loss of the Hollywood actor – who to them was always a brother or a son. Our darling boy, special in so many ways to all of us. You knew you were so loved. You lived life with courage and daring and we are so grateful for the wonderful times we shared. We will be there for Matilda. I can hardly breathe when I try to write this. We were the ultimate in soul mates. I feel both my heart and life have been torn apart. I loved our special talks, our daily chats from where ever you were in the world. I especially loved all the precious time we spent together. We were so fortunate to have you as long as we did. You were so many things to so many people, but to me you were just my little brother. There will never, ever be another "Heath" and I think that in itself is the greatest tragedy. I will continue to talk with you everyday and love you just as if you were here. You will never leave my thoughts "Roast", ever. My beautiful boy, so loving, so talented, so independent, so caring, so young . . . no more chess games mate . . . this is it, couldn't beat you anyway! My body aches for the sound of your voice, our chats, our laughs and our life and times together. Your truly varied artistic skills, insatiable desire to improve and eclectic abilities set you apart from any other person on the planet . . . it had only just started for you ... and for us to further enjoy. We were one, in soul and commitment. Just . . . Father and Son. I will love you forever, Dad. How do we describe our sudden and tragic loss? ... You were the most amazing individual "old soul" in a young man's body. You so loved us, as we dearly loved you. As a close knit and very private family unit we have observed you so determined yet quietly travelling in your self-styled path in life, nothing would get in your way ... no mountain too tall, no river too wide. You dreamed your dreams and lived them with passion and intelligent commitment. We have been privileged to accompany you on a ride through life that has simply been amazing and through it all, we have loved each other beyond imagination. Your true legacy lives on in beautiful little Matilda, who will always remain in the greatest of care. Our hearts are broken. Reading this breaks your heart doesn,t it. 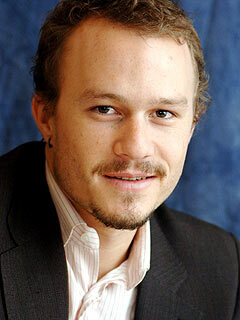 To the parents of Heath Ledger: My heart goes out to you in your loss of your son. You had the pleasure to have known him, but those of us who loved him in his films have the pleasure of having enjoyed his work which will live on. May he rest in peace. The stars and the moon guide Heath Ledger. Your Ennis Del Mar gave courage to so many, freed so many hearts from fear. POST your condolences to Heath Ledger's family here. To express your sympathy for Heath Ledger's family, please post your condolences in the story comment section below. Thanks for the link, Louise. I posted, too: My deep condolences to all of Heath's family at this sad time. By revealing his own heart, he taught us to know ours. I will miss him very much. Heath Ledger was that actor. Without emotional eruptions or cowboy clichés, he inhabited a character whose struggle with a profound love and loss – both beyond his comprehension – was unforgettable. He died Tuesday at 28. Rarely has the announcement of the Academy Award nominations, made the same day, seemed so unimportant. An internalizing actor whose film roles consistently defied the leading-man expectations assumed of him, Ledger chose to follow his conscience and his muse. Before “Brokeback,” for which he received an Oscar nomination in 2006, Ledger appeared in “Monster's Ball” and “Lords of Dogtown.” We saw him last year in Todd Haynes' out-there “I'm Not There.” For a movie star, he worked – and lived – about as quietly as did Ennis Del Mar. There was more: Lindsey (as in Lohan) was distraught at Ledger's death. Ledger was not at the apartment of Mary-Kate Olsen. And photos, photos and more photos of Ledger's body being removed from the building. TMZ was not alone in – I don't know any other way to say this – the fine art of ghoulish reporting. Culprits abounded – in both mainstream and tabloid coverage. This isn't the first time we've seen this, and it won't be the last. I just didn't expect Heath Ledger to be in the middle. Silly, naive me. Sorry me, too. Sorry for a child named Matilda, now without a father. Sorry for those who read and watch and listen, who deserve better. Sorry for those whom I must accept, like it or not, are my colleagues in the media. Sorry, most of all, for Heath Ledger, who deserved at least as much dignity as he gave Ennis Del Mar.